He asked me in what area the hotel is located. He was interested because he saw it advertised by one of our tenants, who shared only the address and phone number, but not the area. When the caller was told the Bush Hotel is in Chinatown, he hung up. Chinatown has been branded a dreaded place since the massacre of 12 Chinese gamblers by three Chinese young people. 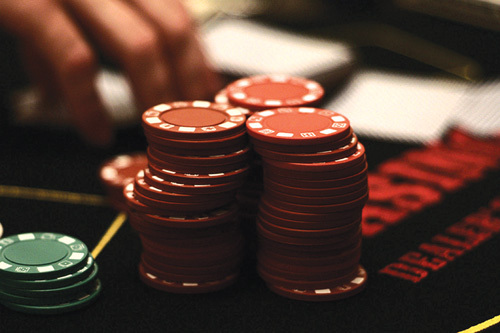 In my 13 years as a desk clerk, I found out the truth about gambling. Gambling continues to flourish despite the authorities who frequent the area. There were many troubles in and out of hotels related to gambling. To mention a few – there was the murder of two Filipino cannery workers of Local 37, where a Filipino community leader was involved. Quarrels because of gambling always ensued among Filipino workers who had just arrived from Alaska. There was one who lost six months of earnings through gambling! How could he face his family back home? What is gambling anyway? Why do many people like to gamble? According to the dictionary, gambling is playing a game of chance for money, or taking a risk for some advantage. There was a lawyer in the Philippines who became a mayor in his hometown for three terms. He bragged in his campaign that he finished law school because he always won at gambling. No wonder in his area, there are lots of gambling joints. It reaches the point where gambling is being conducted in the middle of streets with dead ends. There is a place where two police officers live, but they tolerate the prohibited game. The worst among the worst happened during a Good Friday service in 2007. In the Philippines, Holy Week is observed by many, fanatically, with much respect. Women dress up decently, with no makeup or jewelry. Seldom is a crime committed. Bad guys won’t even sit on a window ledge or say bad words. Liquor stores have almost no sales. You might expect that gamblers, robbers, and drunkards are also in a religious mood. Do you think so? About three years ago, we held a Good Friday service on a big stage in Navotas City. It is commonly called Siesta Palabras (the seven last words spoken by our Lord Jesus at the cross). I could not believe the number of people, mostly adults, who were engaging in a gambling session. We had a large sign and a big wooden cross for people for the religious service. We started the service, despite what they were doing. While I was delivering some words, I was not aware when two police officers suddenly showed up to arrest the gamblers. Every one of them fled in different directions to avoid being arrested, leaving their money on the table. One of them, a heavy-set guy, took cover in a place where the pastors were sitting, pretending to be one of us. None of us had actually called the police, though it may have been a concerned citizen or an angel sent by the Lord. I went to the police headquarters the next day to extend my gratitude. I found out that the chief of police is a born-again Christian. Gambling is a menace to our society. Children are neglected by their parents who enjoy their gambling habits. Most of them become wayward, usually creating trouble in their neighborhood. Some of them become gamblers when they grow up. There was an occasion when a chief of Metrocom Police paid a courtesy call to the mayor of a certain town. He told him that he was on his way with his men to raid all gambling joints. The mayor cautioned the chief that his father was in one of the gambling joints. The chief put all those who were arrested in jail anyway, one of them being the father, with the approval of the mayor. Gideon Sanoy can be reached at ruths206@gmail.com.